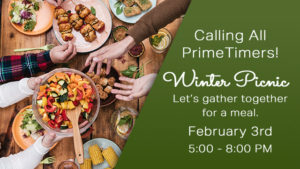 Join the PrimeTimers for a fun-filled Winter Picnic on February 3rd from 5:00 – 8:00 pm. You’ll have an opportunity for a little friendly competition of bean bag toss or to just hang out and visit with our friends! Please bring a dish to share! If you’re age 55+, Prime Timers ministry would love to have you involved. I give Lake Community Church permission to use my photo.I do not give Lake Community Church permission to use my photo.